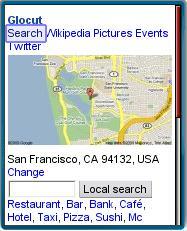 Glocut is one of the nicest local search web apps I’ve seen yet. What sets it apart from all the others is its deceptively simple but effective user interface. When you launch Glocut the first time you will need to enter your location. It’s not very fussy about formatting; a full street address, city, country, postal code or a landmark like “Times Square”; they all work . It gets even better, Glocut has a tiny Java or Windows Mobile native app that you can download. All the app does is retrieve your location from the phone’s GPS and launch the browser passing the Glocut URL with your latitude and longitude embedded in the query string. After launching the browser the app terminates freeing what little resources it was using. What a great way to GPS enable a web app. It works perfectly on my unbranded Nokia N95-3 and should work on any GPS equipped phone that supports the Java ME Location API and allows an unsigned application access to location data. Once Glocut knows were you are it displays your location on a map and and initially shows Google Local search results for nearby hotels. Not looking for a hotel? You can enter a search query or click on links for predefined searches like Restaurant, Bar, Bank, Café, Taxi, Pizza, Sushi or McDonalds. Click on one of those and Glocut displays results centered on your location from the selected category. Glocut’s truly a global application. It seems to recognize address anywhere in the world and the interface is available in 17 languages. This entry was posted in Site Reviews and tagged API, Google, last.fm, mashup, mobile site review, Panoramio, Twitter, Wikipedia by Dennis Bournique. Bookmark the permalink.